AUSTIN, Texas - Sept. 27 2016 - Cirrus Logic (NASDAQ: CRUS) is enabling a dramatic leap forward in single-chip audio and voice processing features for mobile applications with the introduction of its flagship low power smart codec. The Cirrus Logic CS47L90 offers mobile device manufacturers the ability to provide new innovative voice features with audio technology that allows consumers to enjoy a high-fidelity listening experience from their mobile devices. This Smart News Release features multimedia. View the full release here: http://www.businesswire.com/news/home/20160927005151/en/. “Always on” voice activation, noise reduction, active noise cancelation, echo cancelation and speaker protection features empower consumers with greater voice control over their mobile device while delivering a superior, noise-free audio user experience. The CS47L90 provides a premium listening experience with SmartHIFI™ audio playback. SmartHIFI from Cirrus Logic is a unique combination of powerful DSP processing and high-performance analog circuits to deliver an audio experience typically associated with high-end audio equipment, now optimized for mobile audio playback. The CS47L90’s ultra-low power consumption, both in standby and operational modes, also enables significant battery life savings. The CS47L90 is supported on multiple application processor platforms, enabling a consistent feature set and high performance capability across a wide variety of handsets from leading OEMs. A variety of interfaces allows for integration with all of the key components in the complex architectures of the latest mobile devices, including baseband and applications processors, wireless audio transceivers, analog or digital MEMS microphones and boosted speaker amplifiers. The devices support popular voice-wake trigger engines, including Google Hotword and Sensory TrulyHandsfree. In addition, development tools are available for customers and third-party IP providers to develop custom solutions on the programmable Cirrus Logic DSP core. Cirrus Logic continues to develop market leading hi-fi technology for the playback experience, innovating on all aspects of the playback path, ensuring that the smartphone or the smart codec inside does not limit the user listening experience. Supporting 32-bit audio playback and integrating low series resistance and low jitter clock circuits, the CS47L90 is designed to ensure that the hi-fi DAC and headphone amplifier circuits deliver a clean, transparent audio signal with flat frequency response all the way to the output of the headphone. Combined with dynamic adjustments to the audio playback based on the content being consumed, the new flagship smart codecs from Cirrus Logic deliver the best audio experience with minimal power consumption to allow users to enjoy their music longer. 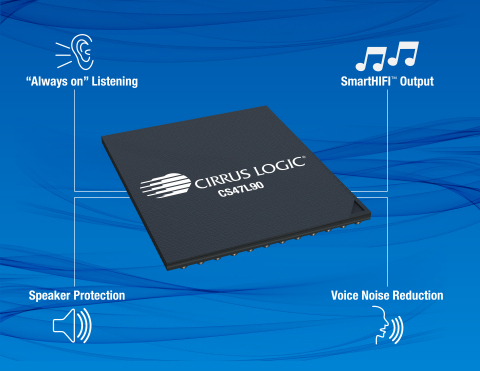 Cirrus Logic is a leader in high performance, low power ICs for audio and voice signal processing applications. Cirrus Logic’s products span the entire audio signal chain, from capture to playback, providing innovative products for the world’s top smartphones, tablets, digital headsets, wearables and emerging smart home applications. With headquarters in Austin, Texas , Cirrus Logic is recognized globally for its award-winning corporate culture. Check us out at www.cirrus.com. Cirrus Logic, Cirrus, the Cirrus Logic logo design and SoundClear are registered trademarks or trademarks of Cirrus Logic, Inc. © 2016 Cirrus Logic, Inc. All rights reserved.